Pros: A look at World War Two from a slightly different angle that doesn’t remove any of the awful-ness of period whilst allowing a man’s love and honour to shine through. Cons: Focus is a little broad which left me wanting to know more about the man; technical design not quite level with the artistic performance. Overall: Poignant monologue told through a well-scripted play that attempts to combine the horror of the time with the history of an important man. The Lion & Unicorn is a typical North London pub with the sophisticated style of a fashionable gastro pub, but it has a little added extra in the form of a theatre. The venue above it is a small box theatre which seats roughly fifty and which provides its visitors with intensely intimate performances. 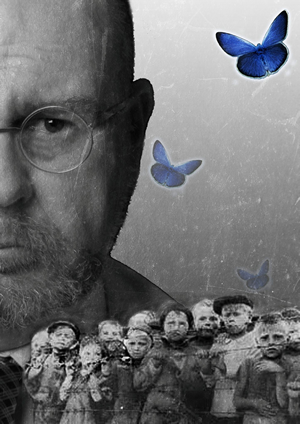 The current show, Confessions of a Butterfly, allows us an all-too-brief glimpse into the life of Janusz Korczak, a Polish Jew who not only dedicated his life work to children but who, in the end, gave his actual life for them. We follow Korczak (Jonathan Salt) as he reminisces about his life and the children. Set in a grotty room in a rundown house somewhere in the Warsaw Ghetto, we gain a strong understanding of what he stood for, how he dealt with the difficult situations he came into contact with and why he did what he did when he marched onto the train that would take him to his death, hand-in-hand with the children he swore he wouldn’t leave. Salt rightly deserves the applause he gets at the end of each night. He spends an hour and a half on stage delivering a complex, emotional monologue that twists and turns, where he has to talk to invisible children, act out Korczak’s own childhood and reveal both the physical and emotional erosion on this old man. Unfortunately he did stumble over a number of sentences all the way through the show but he corrected himself efficiently. The direction was very smooth. Sam Conway’s ability to bring out the character in his actor was very obvious and his use of improvisation during the rehearsal period seemed to make Salt personify rather than simply portray Korczak. This was very clear when, by the end of the show, I recognised not a one-dimensional character but a human being who had his weaknesses and dealt daily with a multitude of complex issues surrounding both himself and his children. Equally, Salt’s script allowed these concerns to be illuminated, although I would argue that perhaps too much of Korczak’s life was packed into an hour and a half. Human lives are too complicated for the audience to be able to understand within an evening and I felt I was left a little in the dark about a lot of his life simply because there just wasn’t time to explain everything. The design was well done, although the sound (Adam Connor of Iguana Studios) stood above the set and lights. While the use of lighting was clever in places, it felt both under and over used at other times. The set was great for such a small theatre, however the props all seemed placed for the script which detracted from an otherwise natural set; perhaps it would have been better if there were a small number of props on stage that weren’t needed for the progression of the show. The sound design was beautiful and really helped the audience to experience the show emotionally; special notice goes to Tom Pickard’s violin solo and the voiceover artists who provided the meaningful ‘diary extracts’ at the very end when Korczak was being walked to the trains. Overall, the show has a poignant message to pass on, which it delivers through concentrating on one man’s life. While the developers hope the audience will go out and discover more about Korczak, I took a greater meaning from the show. These types of plays need to be performed; they go some way to remind the modern audience of the horrors of World War Two and theatre provides a platform which can be excellently utilised to not only remind audiences of the past but also to encourage them to feel real emotion for something that happened over sixty years ago. Korczak was a special individual whose name deserves to be better known than it currently is. Confessions of a Butterfly is a honourable attempt to pay tribute to him. While there are a few rough technical patches that could be improved, I still think this show is one that needs to be seen purely for its significance. Confessions of a Butterfly runs at the Lion & Unicorn Theatre until 29th September 2012.